Jobs officially returned to Apple in late 1996 when the company acquired NeXT, and the next year he would retake his position as CEO. Then in 1998, he oversaw the unveiling of the original iMac, taking the company in a new direction that would eventually lead to its tremendous success and resurgence. The event, dubbed "Back on Track," was held May 6, 1998, when Jobs was 43. Then the "interim CEO," Jobs unveiled a drastically different looking Mac designed by Jony Ive that, at the time, was controversial among fans of Apple. This past weekend, that event was recreated in San Francisco for a scene in the upcoming Steve Jobs movie. 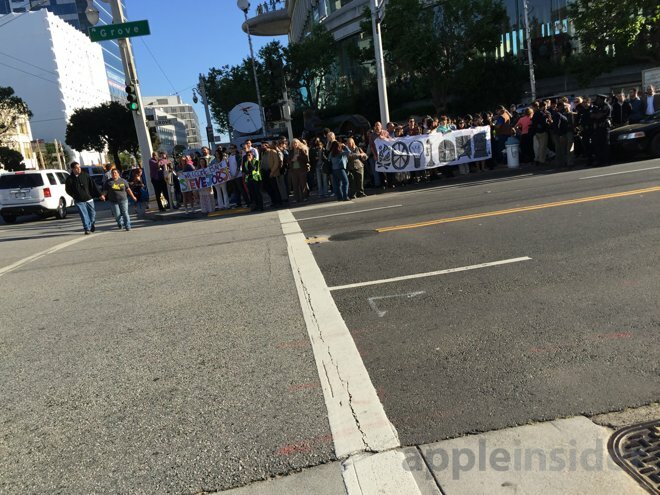 One AppleInsider reader was in attendance as an extra, and provided the included pictures. 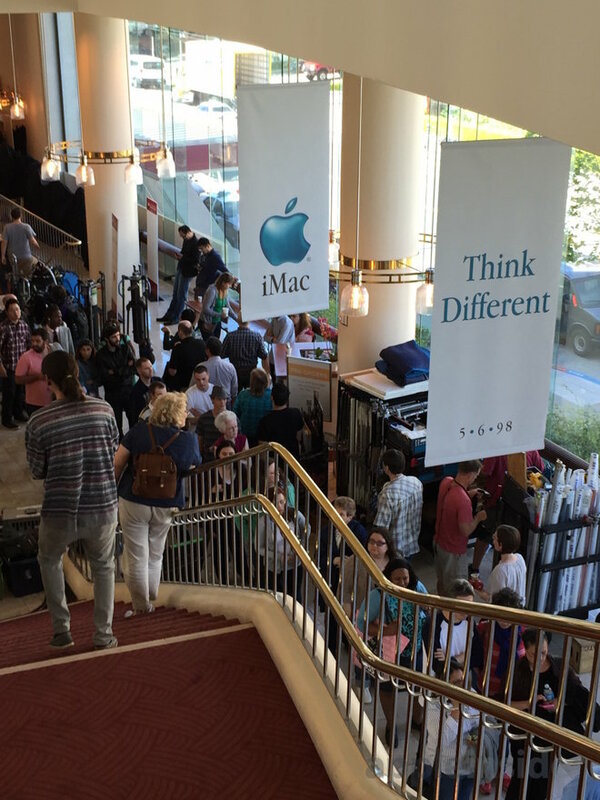 In the scenes filmed, banners featuring Apple's iconic "Think different" campaign can be seen, along with ads showcasing the iMac name and Apple logo. In another scene filmed outside, extras play Apple fans excited for the return of Jobs, holding signs welcoming him back to the company and comparing the first Macintosh to the greatest inventions in human history. The Jobs film was written by Academy Award winning screenwriter Aaron Sorkin, who previously revealed that it will revolve around three iconic product launches in Apple's history. Those will apparently conclude with the iMac's debut in 1998. Starring Fassbender as Jobs and directed by Oscar winner Danny Boyle, the film is scheduled to hit theaters on Oct. 9. It also stars Jeff Daniels, Seth Rogen, and Kate Winslet, and the script is based on Walter Isaacson's 2011 biography of Jobs.